The Literatur Haus was founded in 1986 as the literary center of west Berlin in an 1800s villa. It hosts a books store, books presentations, exhibitions, literary projects of both, German and international literature, and a bistro cafe with a winter garden facing the front yard, for these times when the weather is not that friendly. 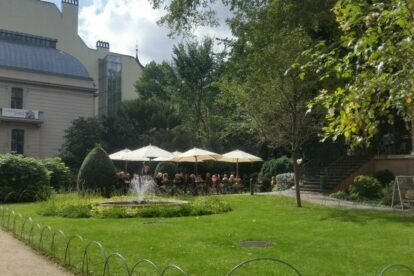 But even in the remote case that you don’t like books, this idyllic garden hosting the bistro terrace is like an oasis in this vibrant part of the city, where you can enjoy a snack or a dessert with a coffee, tee, a cup of wine or a beer. They offer a seasonal menu that changes weekly. Breakfast is served until 11:00, and warm, freshly prepared bistro cuisine from 11:30 until 23:00. There’s a rich cake buffet too. Their cheese cake is one of the most renowned in the city! I really like sitting there during my lunch break, reading, just relaxing a bit, and enjoying, for instance, the cream cheese with ratatouille sandwich.